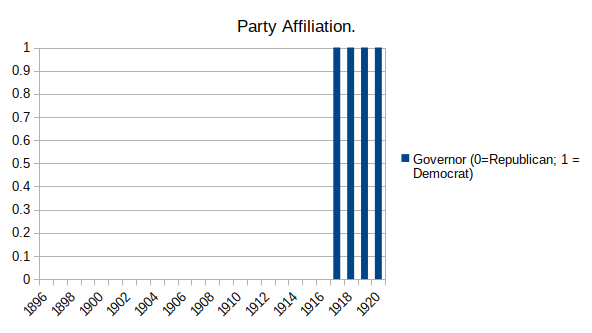 This chart format seems to suggest that Democrats are something and Republicans are not. 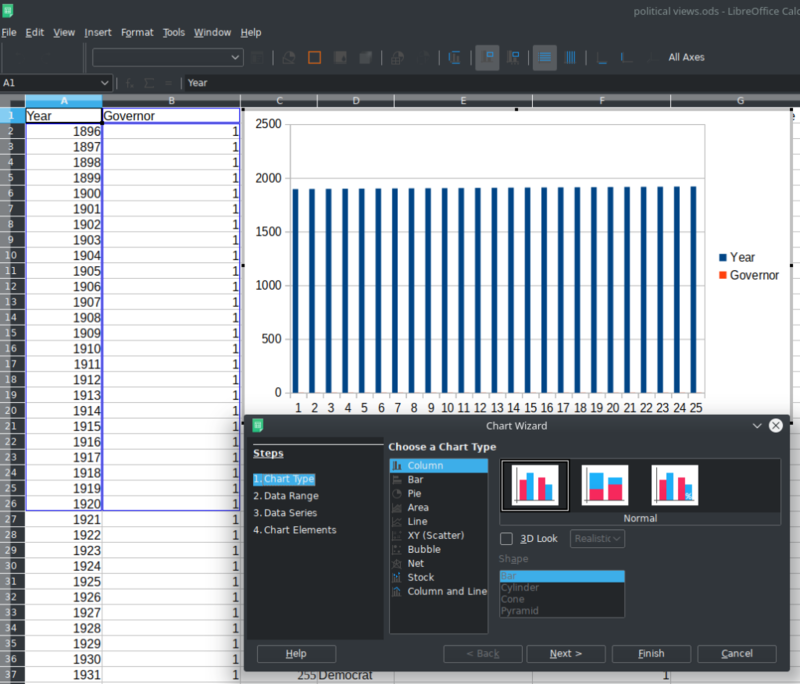 I realized, then, that what I needed was a way to tell the software which color to code each bar in the bar chart. 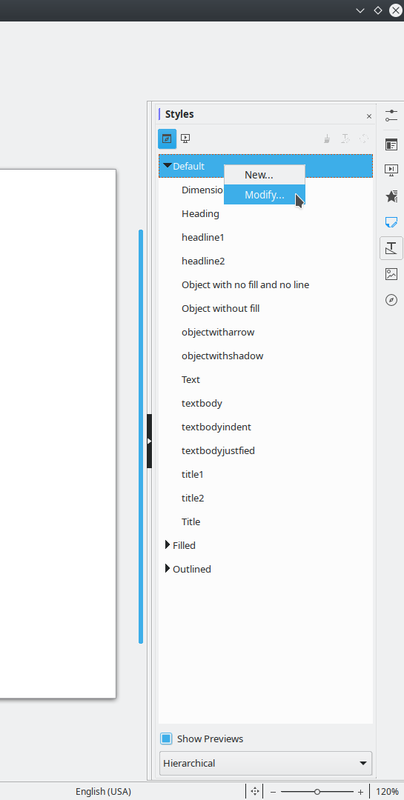 Of course, that is possible by clicking on every single bar and customizing the color. But, with my data already indicating whether it should be one color or another and with over 100 cases to code, I was hoping to find a better approach. 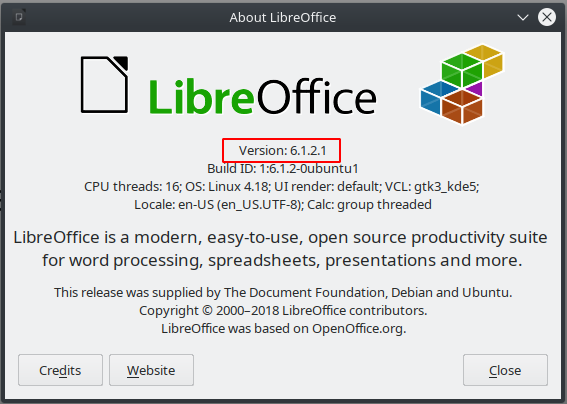 I ended up finding a couple of websites (here, here, and here) that discussed a feature in LibreOffice Calc that was introduced in version 4.5 called “property mapping.” That seemed to hold the answer. 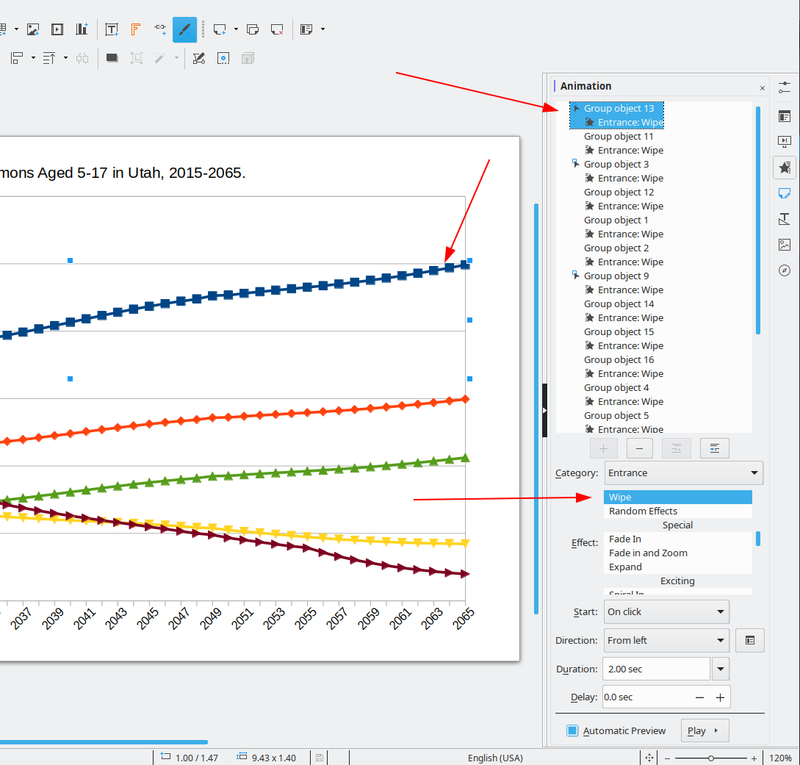 However, as of LibreOffice 6.0.3 (the version I happened to be using), the “Property Mapping” option in the Data Range window of a chart was gone. Even so, the general process still works. 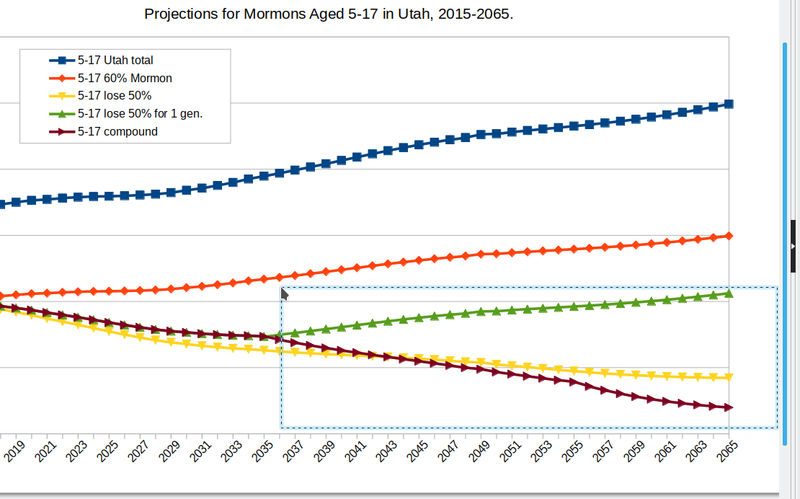 So, here’s how to create the kind of chart I wanted. 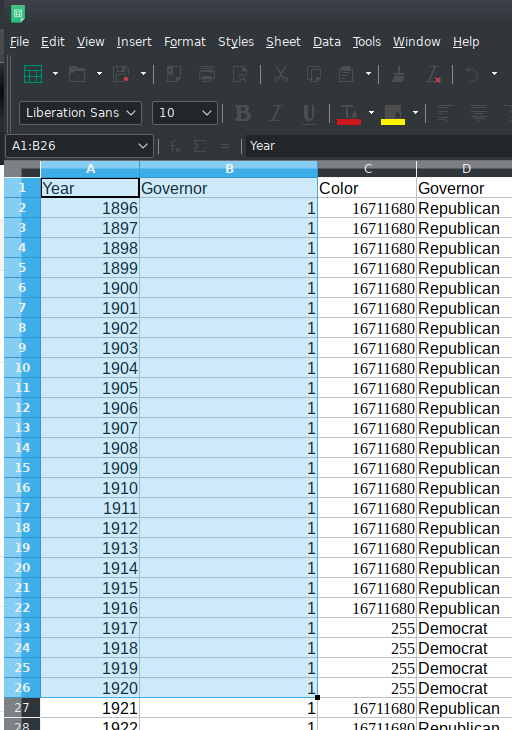 The problem with this, of course, is that I have coded everyone in the dataset with a “1” even though, in reality, some of the Governors in this dataset were Republicans and some were Democrats. 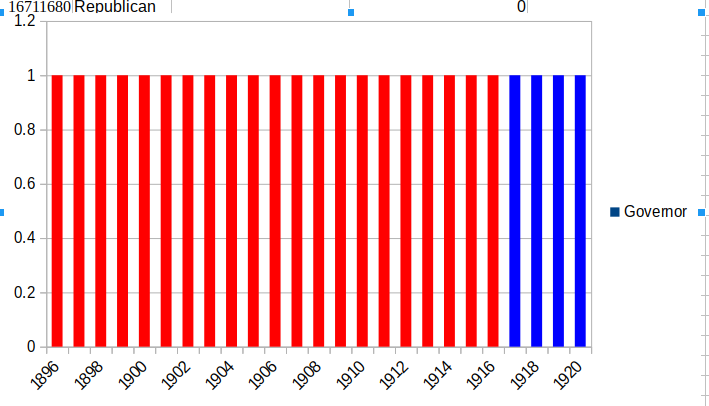 Right now, it looks like everyone was a Democrat, but this is where the conditional formatting comes on. 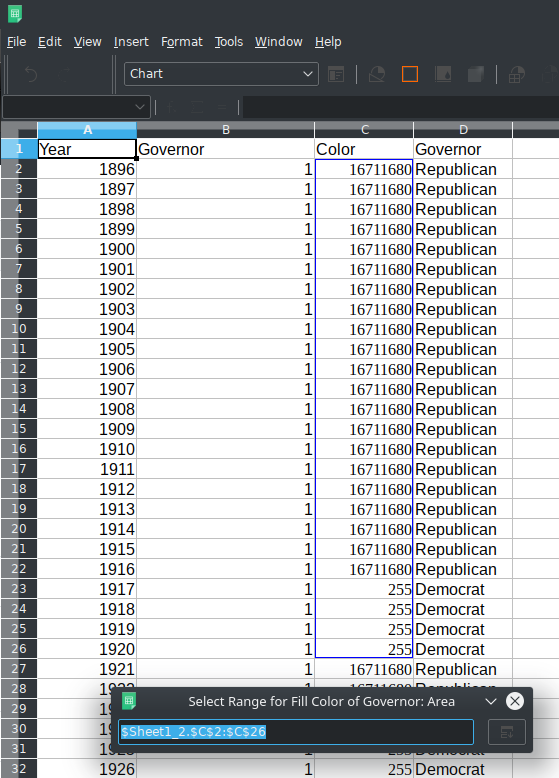 Basically, what this code does is checks to see whether a cell has “Republican” in it or “Democrat.” If it is Republican, color 255,0,0 is selected (RED, which is reported in the cell as 16711680). If it is Democrat, color 0,0,255 is selected (BLUE, which is reported in the cell as 255). The last part of the formula indicates that everyone else should have a different color (YELLOW = 255,255,0). Dragging that down, I get a color code for every one of the values in my chart. 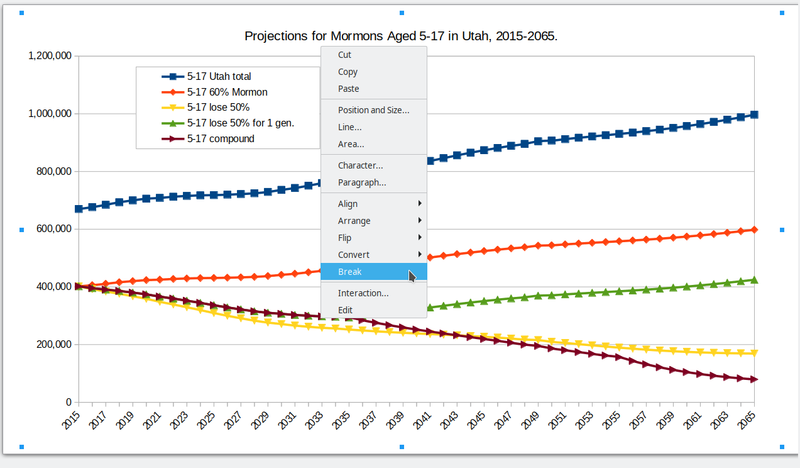 Once I have this in place (which should really be done before you start the chart wizard, but can be done after the fact), now I can use this to adjust the bar fill color in my chart. 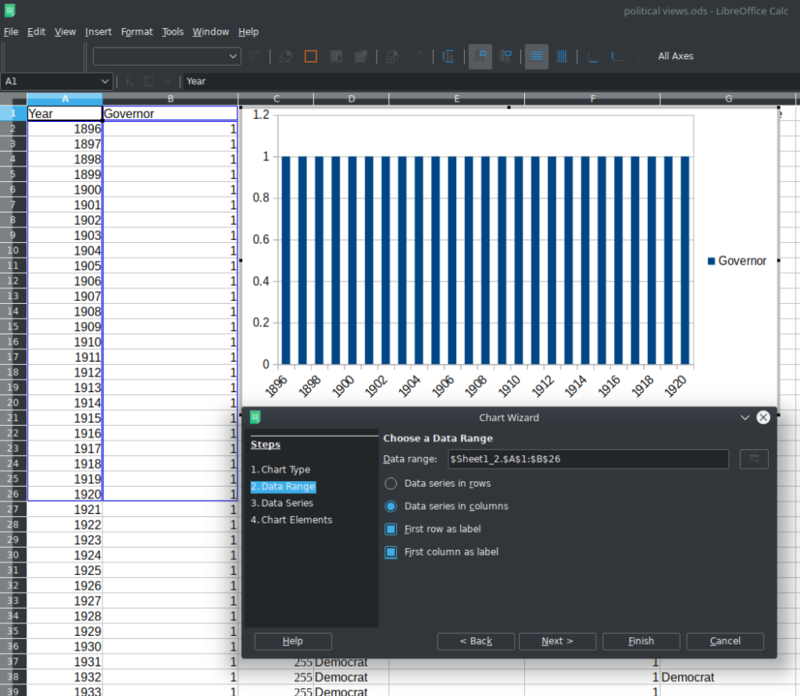 The chart provides a graphical representation of a dichotomous variable using color to illustrate shifts between political parties without suggesting that one party is better than the other. 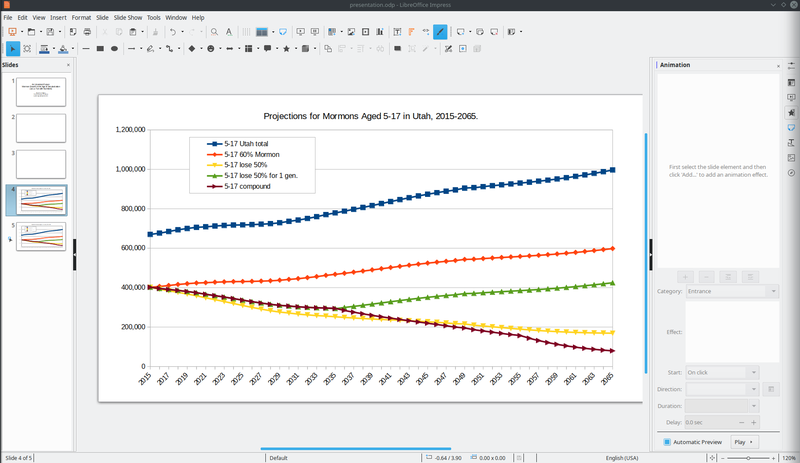 Et voila – conditional color formatting in LibreOffice charts. For about the last seven years (since 2012), I’ve been using a Synology NAS (Network Attached Storage) device in my house as a central repository for files, photos, music, and movies. It has generally worked well. However, there have been a number of serious problems with the Synology NAS I bought (DS413J). First, the amount of RAM is limited and cannot be upgraded. 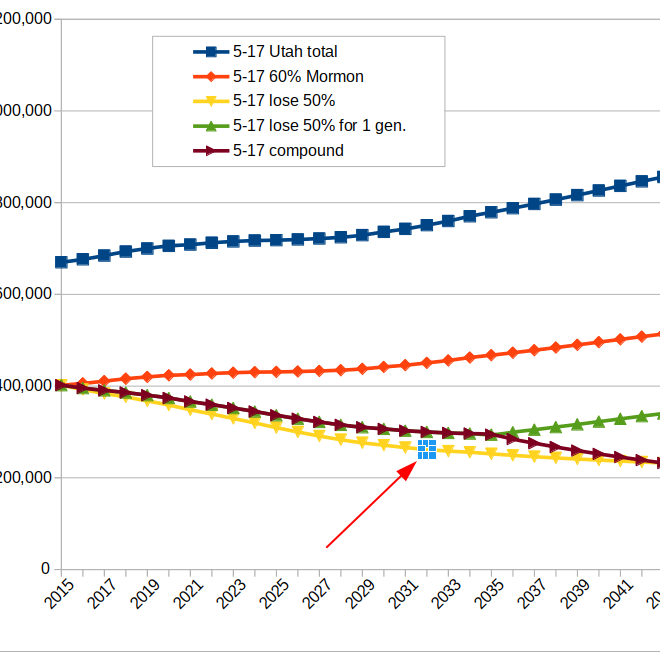 Second, the CPU (MARVELL Kirkwood, Arm processor) is in the same situation. While the box is small and draws very little power, the inability to upgrade the hardware (other than hard drives), means that I’m basically stuck with what was considered cutting edge back in 2012 when I bought it. In practical terms, these limitations have meant that I have not been able to run Crashplan on my Synology box since the first year I bought it because I have more than a terabyte of files I am backing up and the 512 mbof memory cannot handle that (I created a workaround where I run Crashplan on a different computer, but am backing up the files on the Synology box over the network). It also means that I haven’t been able to run the latest version of Plex for the last 4 years because Plex stopped supporting the CPU in my Synology box. This eventually came to a head about a month ago when the latest Plex client on my Roku stopped working with the very outdated version of Plex server on my Synology NAS device. As a result, I was no longer able to serve videos to my Roku, which was one of the primary reasons why I even have a NAS in the house. The convenience of having a pre-built NAS with a web interface has been nice. There is a lot to like about Synology products. However, you are locked into their hardware and their software and are restricted by their timelines for upgrading to the latest software. Additionally, my Synology NAS, which is a 4-bay device, has a problem with one of the bays that actually ended up destroying 2 hard drives, so I only have 3 usable hard drive bays. And, Synology devices are crazy expensive. Given my use scenario, paying as much as they now charge for a high-end NAS that might temporarily meet my needs doesn’t make a lot of sense. So, I finally decided that it’s time to go back to building my own NAS (I had one for a short while before). As I started researching what I wanted for my Do It Yourself (DIY) NAS, I basically went down a rabbit hole of options: Which Operating System (OS)? What hard drives? What file system for the hard drives? Do I use a RAID? What software do I need to install? What CPU and motherboard? How much memory? In this rather lengthy post, I will detail what I ultimately decided to do and why. As a long-time Linux user, I was never going to consider anything but a Unix-based system. That means I never even considered Windows as an option. Those who use Windows could certainly consider it, but I have no interest in using Windows for my NAS. That, however, didn’t narrow my options that much. With Unix-based systems, all of the following are real contenders: Unraid, FreeNAS, Amahi, Open Media Vault, Rockstor, Openfiler, NAS4Free, or just the Linux distribution of my choice (currently, Kubuntu 18.10). I spent quite a bit of time considering these OSes, all but the last being designed specifically as OSes for NAS boxes. 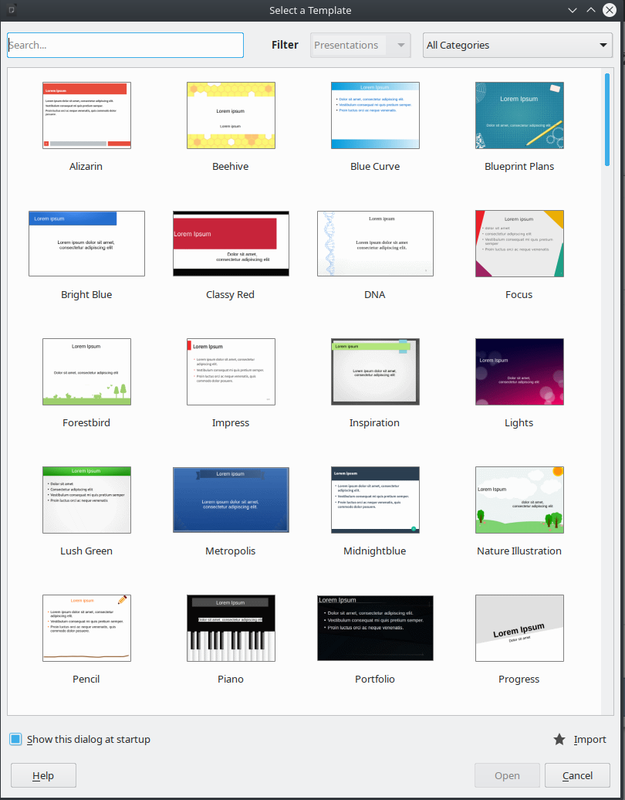 The more I thought about theses pre-packaged options, the more I realized that they fall in between the proprietary OS of my Synology box and the OS I use on all my other computers (Kubuntu), and they are all crippled (to varying degrees) by the same problem I had with Synology – I am beholden to the companies/people who maintain this software to release new packages for the software I need to run: Crashplan and Plex. This is a particular concern with Amahi, Rockstor, Openfiler, and NAS4Free, since they all require the installation of software through their “packages.” That would not be the case if I just went with a standard Linux distribution that gets regular updates (e.g., Kubuntu). I can install pretty much whatever I want on such an OS, which means the NAS will be whatever I want it to be. Unraid (which isn’t free) will really allow you to install an OS on top of their OS, so that might not be a problem. But I’m also not convinced that I need Unraid for drive management (as I’ll detail below when I discuss how I organized my hard drives). FREENAS is probably the most appealing OS for this as it really is just an OS, and you can install what you want on top of it. My biggest concern here is that FreeNAS is BSD based, which really shouldn’t be a concern, but I have limited experience with BSD (tons with Linux), and I wasn’t certain what FreeNAS would give me over a standard distribution. There very well may be advantages to one of these specific OSes for NAS devices that I am missing. But, after having suffered under the proprietary lock-in and inability to upgrade my software under Synology, I realized that I was very wary of getting locked into a pre-packaged OS that would mean I couldn’t install what I want to install. Ultimately, I decided to just install Kubuntu 18.04 on what would become my new, DIY NAS box. 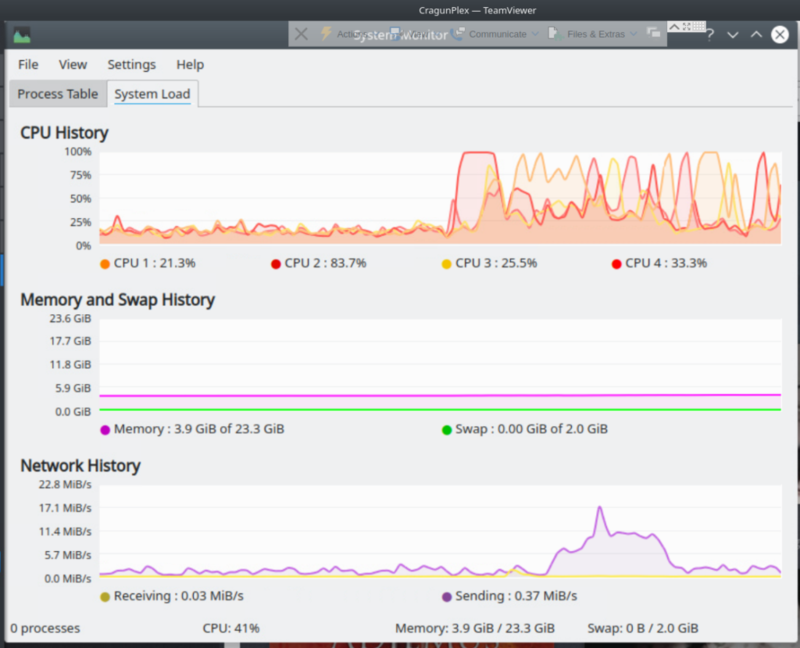 Some might note that I should have just gone with Ubuntu server, as it reduces the amount of CPU power and memory since I wouldn’t have a graphical front end (KDE). I considered it. But that would also mean that I would have to manage the entire device through the command line or try to find some other software (e.g., webmin, which won’t do everything I need) that would allow me to monitor my device via a web browser. 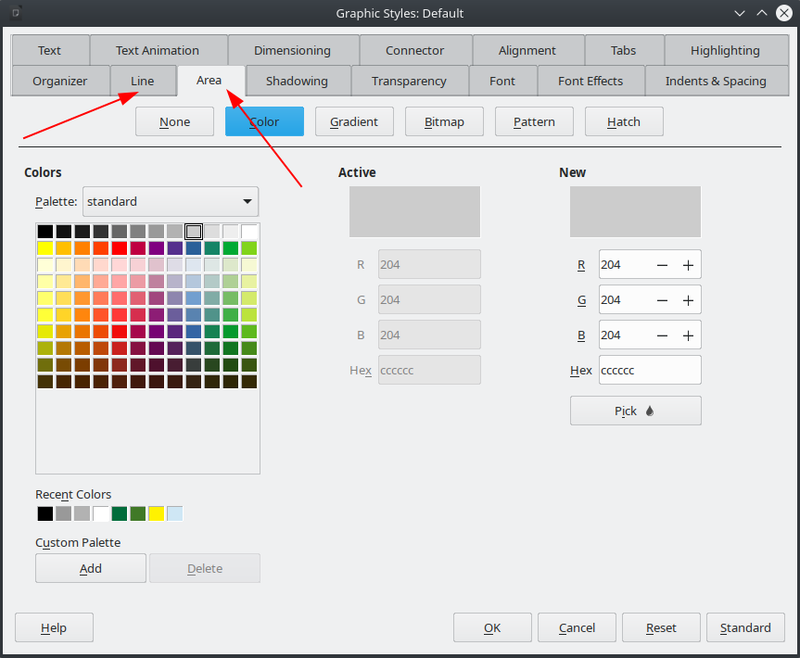 Since I’m most comfortable with a graphical desktop environment, why not just go with what I know and what works for me? Final choice on OS: Kubuntu 18.04, which is a long-term support release (important for future upgrades to the OS). When Plex stopped working with our Roku, my wife quickly realized it. We all use Plex on a regular basis to watch our movie and TV collection. When I told her what the problem was and said that I thought I was going to need to replace our NAS, she asked me how much it was going to be. Being honest, I told her it could be fairly expensive, depending on what I decided to build. Luckily, we are in a position financially where I could spend upwards of a $1,000 on a new NAS if I needed to and she said that would be fine. I spent quite a bit of time consider hardware. The biggest question was really whether I wanted to go with dual Xeon processors to build out a real server or go with what I am most familiar, AMD CPUs like Ryzen (I build all my own desktop computers). The dual Xeon approach made a lot of sense as they can manage a lot of concurrent threads. The latest processors from AMD (and Intel, but I’m an AMD guy), Threadripper, also manage a lot of simultaneous processors. However, these are all pretty expensive processors, even somewhat older Xeon’s can be a little pricey if I’m trying to get something that was made in the last few years. Additionally, the motherboards that go with these can be almost as expensive. I debated these options for quite a while. Then, I had an idea. I had an older computer lying around from my latest upgrade (I usually upgrade my desktop, give my immediate past desktop to my wife; during the last one, I ended up upgrading the entire device, case included, which left a third desktop computer sitting unused). I wanted to test out Plex and Crashplan on that computer just to make sure it worked. It’s an older AMD Athlon II X4 620 that has 24 gb of RAM and room for 8 SATA devices on the motherboard. Once I got everything up and running on this test system, I realized that, given my use scenario, I actually didn’t need the latest Threadripper AMD CPU or even dual Xeon processors. I don’t need concurrent ripping of 4k or 8k video files. I don’t even have any 4k video files (my main TV has 4k capabilities, but I rarely use them). Most of my video is 1080p, which looks great. I tested the system out streaming a video to my TV and backing up files and it worked great. So, I decided to re-purpose this older computer and make it my new NAS. Simultaneously streaming to five devices on the home network. All four CPUs were never maxed out simultaneously. Conclusion: My older AMD Athlon X4 620 was more than up to the task. With two simultaneous 1080p video streams and three mp3 streams, the server was working, but it was far from maxing out. Since we have just one TV in the house, the odds of us ever needing to simultaneously stream more than two videos are almost zero, and that’s true even considering that I am allowing some of my siblings access to my Plex server. What does this mean for the average person building a DIY NAS? Unless you have, let’s say, 10 4k TVs in your house and you want to simultaneously stream 4k videos to all of them, you probably don’t need the latest and greatest CPU in your NAS. In all likelihood, I’ll let the system I have run for a year or two (unless there is a problem), and then upgrade my box, my power supply, my mother board, and my CPU (which will also require upgrading my RAM). By that time, Ryzen Threadrippers will have dropped in price enough that it won’t cost me $2,000 to build a beast of a NAS that can serve multiple 4K streams at the same time. I’m not sure I’ll ever need that much bandwidth or power given my use scenario, but I can imagine needing a bit more power in the future. Where you probably do not want to skimp is on RAM. As I have been transferring my files and media to my new NAS from the old one, I have seen my RAM usage go up to as high as about 16 gb at different times. That has been the result of large bandwidth file transfers, Plex indexing the media files (video and audio), and simultaneous streaming of files. In short, you can go with an older, not crazy expensive, multi-core CPU for your NAS and be fine, but make sure you’ve got at least 16 gb of RAM, maybe more. Where I got the most bogged down in my research was in deciding on how many hard drives to use, what file system to use, and whether or not I should use a RAID for the drives. In my Synology box, I had just two 4 terabyte hard drives in a RAID 1 (or mirror) arrangement. While I am getting close to filling up the 4 terabytes (I have about 3 terabytes of photos, movies, files, music), I was more concerned with not losing data. With a RAID 1, all of my data was backed up between the two hard drives. Thus, if I lost a drive, I would still have a copy of all of the data. Additionally, I pay for unlimited storage through Crashplan. Everything on my NAS is backed up off-site. This way, I have a local copy of all of my files (the mirrored drive) and an off-site copy of all my files (in case there is a fire or catastrophic failure). Since I do back up everything off-site, I could theoretically just go for speed with, for instance, a RAID 0 that stripes all my data between drives. But a failure would mean I would lose all my local data and I would have to restore from the off-site backup (which would take quite some time given the amount of data I have). As I considered the options for hard drives, my initial thought was to use the same system but increase the size of the hard drives. There are now hard drives with capacities in excess of 10 tb. They are expensive, but two 10 tb hard drives in a RAID 1 would basically replicate what I was doing but give me plenty of room to grow my photo, video, and file collection. 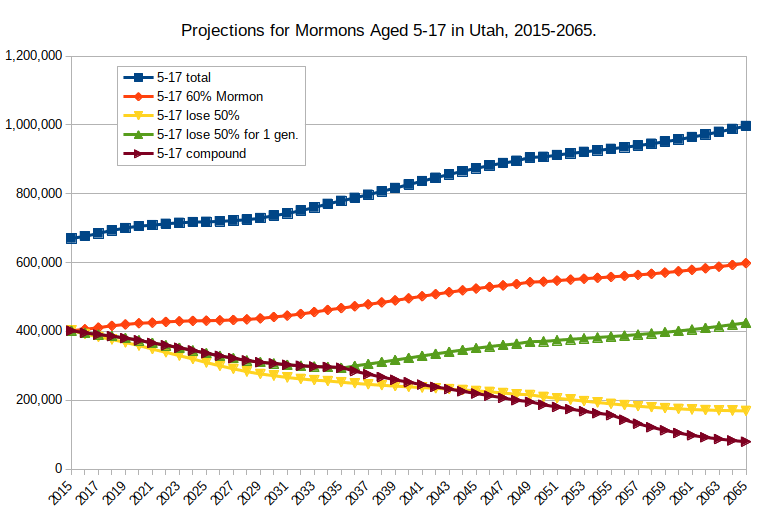 I was just about to pull the trigger on this plan until I realized that another option might make more sense. RAID 6 requires 4 hard drives, but offers a number of advantages over RAID 1 (e.g., similar speed but better redundancy, as well as the possibility of hot swapping hard drives). And, if I went with RAID 6, I could actually buy cheaper, 4 or 6 tb hard drives instead of 10 tb hard drives and end up with just as much or more space as I would get with two 10 tb hard drives for less money. From the many articles I read on this, it seems that lots of corporations use a RAID 6 given the redundancy and speed advantages that result. I ultimately decided to go with a RAID 6 with four 4 tb hard drives. Effectively, that meant I would be doubling my storage (8 tb) while improving my redundancy. DIY NAS: What software to install? I have been running Plex for about 6 years to manage my media collection. With my Synology box, the limited RAM and not very good CPU meant that it actually had a pretty hard time managing my media collection. It would transmit videos across my network to my ROKU device, but only if they were in a specific format (mp4, which was probably a limitation of the Synology box as that is not a problem with Plex or ROKU). Setting up a video slide show was basically impossible on my ROKU from my Synology box as the CPU and RAM just couldn’t cut it. While I could play my music across the network, the Synology box would also not play nice with my music in Plex. 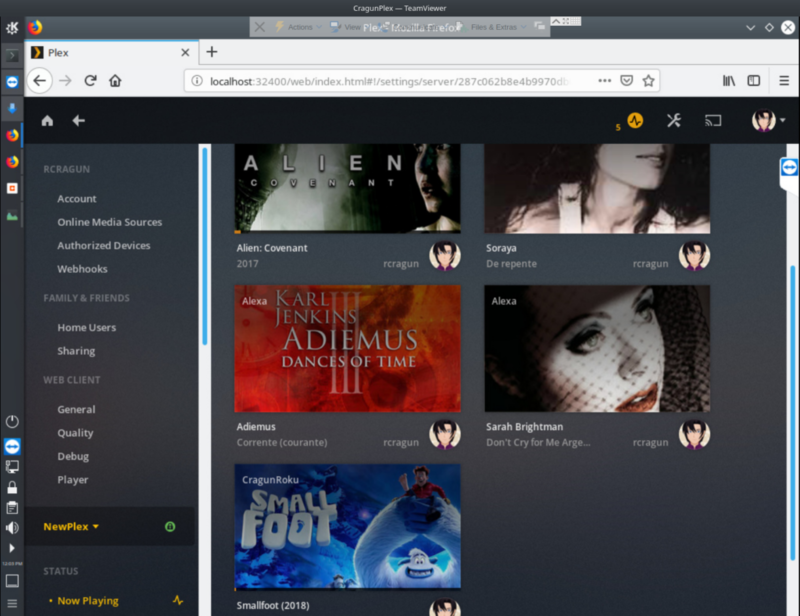 As a result, I used Plex just to watch videos but not for anything else, even though it is a great way to manage all sorts of media – video, photos, and music. Thus, one of the requirements of my new DIY NAS would be that it has to take advantage of all the features that Plex has to offer (I have a lifetime Plex Pass). So, Plex was the core requirement for my NAS. But I also wanted my NAS to run Crashplan. As noted above, my Synology box didn’t have enough RAM to run Crashplan, which meant I had to run it on my desktop to backup the files on my NAS to Crashplan. It was a hack to get around the limitations of the Synology NAS (FYI, you need about a gigabyte of RAM for every terabyte of files you want to back up to Crashplan). Plex and Crashplan were minimum software requirements. My DIY NAS had to be able to run both of those and run them well. I do occasionally download stuff via bitTorrent (mostly Linux distributions). So, having a bitTorrent client installed would be nice. Kubuntu comes with one, kTorrent, which was fine. The last piece of software I really needed was a way to control my NAS remotely. The goal was to basically have it run headless, stick it in a corner in my office, and just let it do it’s thing. I can control the Plex server through the Plex website, but to do everything else I would need VNC software. I was actually surprised at how difficult it was to find software that would let me control my NAS. I tried Remmina first and had no luck. The interface was clunky, not intuitive, and I only was able to successfully connect about 1 time out of 10. I finally went with TeamViewer. I needed something that would let me reliably VNC into my NAS and control whatever I needed from anywhere. TeamViewer is free for personal users and works reliably. Another good alternative is nomachine. Also, in order to make this work reasonably well, you need to install a dummy driver for the X11 driver and create an X configuration file for the dummy driver, as detailed here. Otherwise, the VNC software will be slow as molasses. This guide made it very easy. 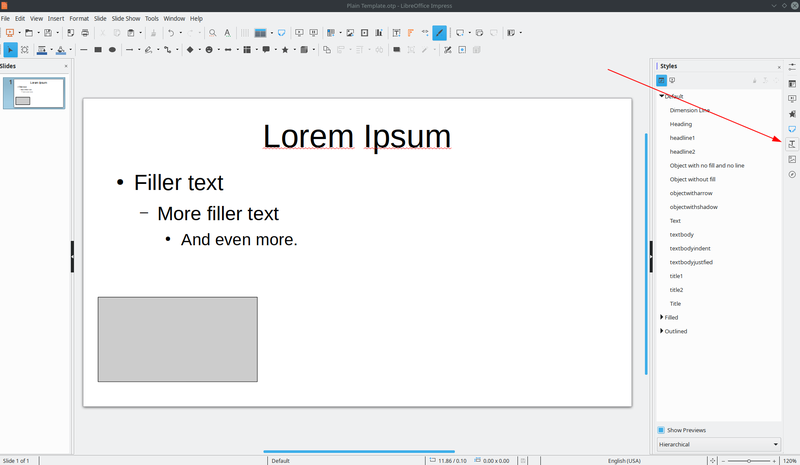 One of the few tasks I have not been able to do on Linux since I switched over from Windows more than a decade ago is optical character recognition (OCR) of PDF documents. I work with a lot of PDFs. Most of them were digital documents to begin with and the text is readily selectable. However, the occasional need arises when I either have to scan something myself or I receive a document that does not have selectable text and is just an image. Up until now, I have kept a software package on a Windows virtual machine (in Virtualbox) specifically to OCR PDFs on the rare occasion when I need to do that. But, I think I can safely move past that thanks to recent advances in OCR on Linux. I scanned a chapter I wrote in a book recently. The scan looked good (especially after I used Scan Tailor’s Dewarping feature to flatten the pages). I then converted the TIF files from Scan Tailor into PDF files, put them in the correct order, and was ready to OCR them in the software I used in Windows. However, my virtual machine was giving me some issues and required me to install some updates that were going to take a while (’cause, Windows!). I got the updates started, then realized that I hadn’t checked to see if any progress had been made on OCR on Linux for quite a while (probably a couple of years). A quick Google search landed me on Stack Exchange (where I seem to spend a lot of time these days). There, I found two new options for OCR on Linux. My initial PDF (on the left below) was 14 mb in size and looked fine, but I couldn’t select the text – it was just an image. 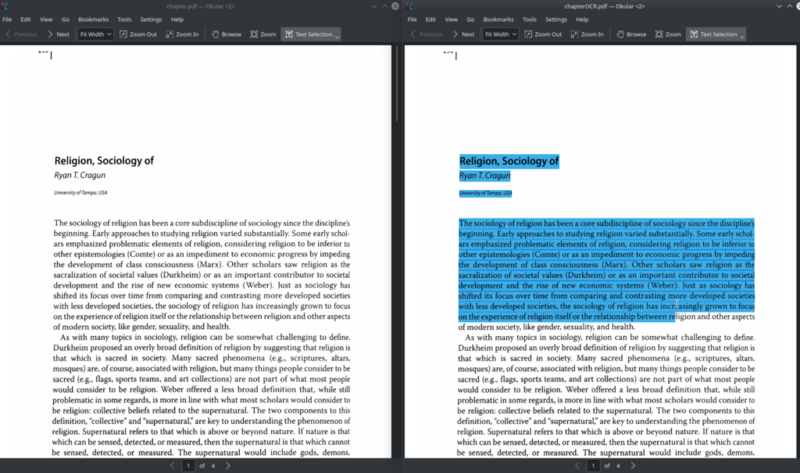 With a quick command, I ran it through the “ocrmypdf” program and got out a nearly identical PDF that was smaller (just 9 mb) and allowed me to select the text (image on the right below). Original PDF on the left; OCR PDF on the right. 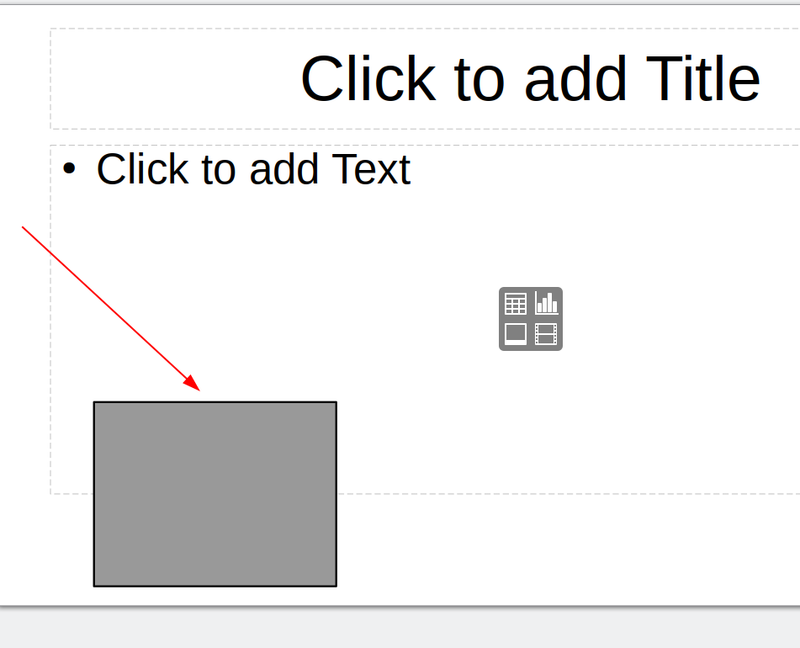 I can select the text in the OCRd image. 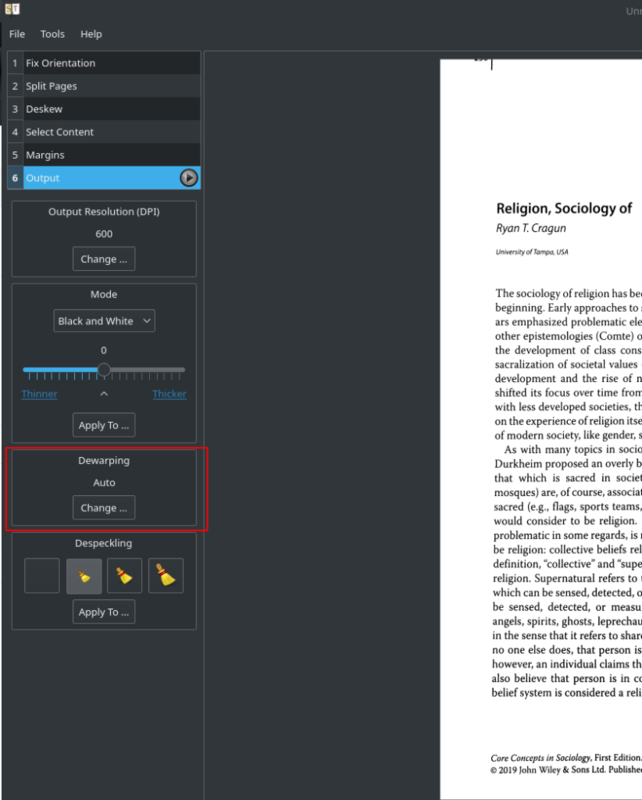 PDF on the left; selected text copied and pasted on the right. As you can see, this isn’t award-winning software. It’s probably 80 to 90% accurate. But that is more than sufficient for what I need most of the time. And, as FOSS, I’ll take it. My rating: 8 out of 10. But given the speed with which I can do this, I’ll absolutely be using this over the old software I was using on a virtual machine before. I then tried to pull up the GUI… And… Nothing. Perhaps I needed to reboot. Not sure. But “ocrfeeder” didn’t seem to be working on my install (Kubuntu 18.10) when I tried to run it.